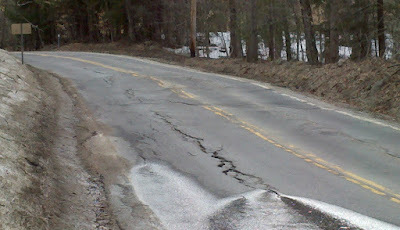 This is a fun little road in southern New Hampshire which is well worth the drive. Running from the center of Jaffrey, NH to the border of Bennington and Hancock, NH, this drive has a little of everything. With a reasonable speed limit ranging around 40+ to a section which is actually at 50, route 137 has sweeping corners and twisting turns with remarkable elevation changes. It's actually quite a technical road, if approached as such and is rather a lot of fun without ever having to break the speed limit. NH route 137 starts at route 202 in the center of Jaffrey and heads north following the lay of the land as it heads into Dublin NH. It sweeps around the shores of multiple ponds and lakes as it approaches NH route 101. Once across route 101, however, it heads into larger hills. As is typical of so many New England roads, the original path appears to have gone from house to house, which means many twists and turns. It's on the section of the road from route 101 to the center of Hancock where the speed limit reaches it's height of 50 MPH while traversing reasonably technical turns; full "S" turns over multiple elevation changes. I was rather pleasantly surprised at both how fun the road was as well as how high the speed limit was through various sections. Once into Hancock the road goes through some more curves and elevation changes while passing through some wonderful scenery then into a very nice New England town. Lined with colonial era buildings, rt 137 passes through the center of town and then heads north to where it connects once again with route 202. While route 202 has been widened and straightened and certainly has high speed limits throughout almost its entire length, route 137 will take longer to cover the same distance and be far more memorable. It's a short drive taking maybe 30 minutes at best, but it's an enjoyable little stint on an old New England road. There's only one challenge; the road surface. With a decent surface this would be the road to take your M3 or 911 for a nice Sunday drive, but as it is currently, better to take a rally car as the suspension and clearance would be better suited. This past Friday I actually took the Jeep, instead of the BMW. This is actually a smoother part of the road. Copyright William A. Birch. Picture Window theme. Powered by Blogger.